For the Chinese province, see Annam (Chinese province). For other uses, see Annam (disambiguation). Annam (Vietnamese: An Nam or Trung Kỳ, alternate spelling: Anam) was a French protectorate encompassing the central region of Vietnam. Before the protectorate's establishment, the name Annam was used in the West to refer to Vietnam as a whole. Vietnamese people were referred to as Annamites. The protectorate of Annam became in 1887 a part of French Indochina. Two other Vietnamese regions, Cochinchina (Nam Kỳ) in the South and Tonkin (Bắc Kỳ) in the North, were also units of French Indochina. The region had a dual system of French and Vietnamese administration. The Nguyễn Dynasty still nominally ruled Annam, with a puppet emperor residing in Huế. In 1948, the protectorate was merged in the Provisional Central Government of Vietnam, which was replaced the next year by the newly established State of Vietnam. The region was divided between communist North Vietnam and anti-communist South Vietnam under the terms of the Geneva Accord of 1954. Annam means "Pacified South" in Sino-Vietnamese, the toponym being derived from the Chinese An Nan (Chinese: 安南; pinyin: Ānnán). In the history of Vietnam, the designation is one of several given by the Chinese to the Tonkin, the core territory of modern-day Vietnam surrounding the city of Hanoi, which included land from the Gulf of Tonkin to the mountains which surround the plains of the Red River. The name has also been applied to the Annamite Range (French: la Chaîne Annamitique), a 1,100 km (680 mi) mountain range with a height ranging up to 2,958 metres (9,705 ft) that divides Vietnam and Laos. The Vietnamese language or its central dialects were called "Annamese", as in the seminal dictionary Dictionarium Annamiticum Lusitanum et Latinum. An Nam is usually considered offensively demeaning to Vietnamese people, and mostly used in sarcastic manners. Trung Kỳ (also spelled Trung Kì) is used instead in formal contexts. Meanwhile, Annamiticum in the dictionary's name is translated as Việt. Towards the end of the 18th century a rebellion overthrew the Nguyễn lords, but one of its members, Gia Long, by the aid of a French force, in 1801 acquired sway over the whole of present-day Vietnam (Annam, Tongking and Cochinchina). This force was procured for him by Pigneau de Béhaine, titular bishop of Adran, who saw in the political condition of Annam a means of establishing French influence in Indochina and counterbalancing the English power in India. Before this, in 1787, Gia Long had concluded a treaty with Louis XVI, whereby in return for a promise of aid he ceded Tourane and Pulo-Condore to the French. That treaty marks the beginning of French influence in Indochina. After conquering Cochinchina in 1858–1862, the French resumed in 1883 their expansion in Southern Asia. The first protectorate treaty was signed in 1883, although it was replaced the next year by a slightly milder treaty. With the treaty of Tientsin, China recognised the French protectorate over Annam and Tonkin and implicitly abandoned her own claims to suzerainty over Vietnam. Annam and Tonkin became part of French Indochina in 1887. On 9 May 1889, they were split in two Résidences supérieures, each subordinated to the Governor-General of French Indochina. The Nguyễn dynasty still nominally ruled over both protectorates. Tonkin was de facto ruled directly by the French, while the imperial government maintained some degree of authority over Annam. On 27 September 1897, the Vietnamese imperial council in Annam was replaced by a council of ministers, presided de jure by the French representative. Annam comprised a sinuous strip of territory measuring between 750 and 800 miles (1,300 km) in length, with an approximate area of 52,000 square miles (130,000 km2). It had a rich, well-watered soil which yields tropical crops, and was rich in naturally occurring minerals. The country consisted chiefly of a range of plateaus and wooded mountains, running north and south and declining on the coast to a narrow band of plains varying between 12 and 50 miles (80 km) in breadth. The mountains are cut transversely by short narrow valleys, through which run rivers, most of which are dry in summer and torrential in winter. The Song Ma and the Song Ca in the north, and the Song Ba, Don Nai and Se Bang Khan in the south, are the only rivers of any size in the region. The chief harbour is that afforded by the bay of Tourane (also known as Đà Nẵng) at the centre of the coastline. South of this point, the coast curves outwards and is broken by peninsulas and indentations; to the north it is concave and bordered in many places by dunes and lagoons. In Annam, the rainy season begins during September and lasts for three or four months, corresponding with the northeastern monsoon and also with a period of typhoons. During the rains the temperature varies from 59 degrees Fahrenheit (or even lower) to 75 °F (from 15 degrees Celsius to 24 °C). June, July and August are the hottest months, the thermometer often reaching 85 °F (29 °C) or 90 °F (30 °C or more), though the heat of the day is to some extent compensated by the freshness of the nights. The southwest monsoon which brings rain in Cochin China coincides with the dry season in Annam, the reason probably being that the mountains and lofty plateaus separating the two countries retain the precipitation. the cultivation of rice, which grows mainly in the small deltas along the coast and in some districts gives two crops a year. Silk spinning and weaving were carried on in what the Encyclopædia Britannica Eleventh Edition called "antiquated lines ...silkworms [are] reared in a desultory fashion". Other crops were tea, tobacco, cotton, cinnamon, precious woods and rubber. Coffee, pepper, sugarcane and jute were also cultivated to a minor extent. The exports comprised tea, raw silk and small quantities of cotton, rice and sugarcane. The imports included rice, iron goods, flour, wine, opium and cotton goods. There were coal mines at Nong Son, near Da Nang, and as well as mining of gold, silver, lead, iron and other metals which occur in the mountains. Human trafficking in Annamite women and children to China occurred from the 1870s to the 1940s. Trade, which was controlled by the Chinese, was mostly carried out on the sea, with the chief ports being Da Nang and Qui Nhơn, open to European commerce. 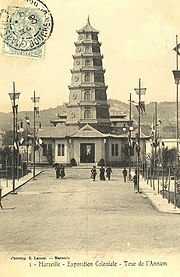 Postcard of the Annam Tower, built in Marseilles for the 1906 Colonial Exhibition. Annam was ruled in theory by its emperor, assisted by the "comat" or secret council, composed of the heads of the six ministerial departments of the interior, finance, war, ritual, justice and public works, who were nominated by the emperor. The Resident Superior, stationed at Huế, was the representative of France and the virtual ruler of the country. He presided over a council (Conseil de Protectorat) composed of the chiefs of the French services in Annam, together with two members of the "comat"; this body deliberated on questions of taxation affecting the budget of Annam and on local public works. A native governor (Tong Doc or Tuan Phu), assisted by a native staff, administered each of the provinces into which the country was divided, and native officials of lower rank governed the areas into which these provinces were subdivided. The governors took their orders from the imperial government, but they were under the eye of French residents. Native officials were appointed by the court, but the Resident Superior had power to annul an appointment. The mandarinate or official class was recruited from all ranks of the people by competitive examination. In the province of Tourane (Da Nang), a French tribunal alone exercised jurisdiction, but it administered native law where natives were concerned. Outside this territory the native tribunals survived. ^ Chisholm 1911, p. 63. ^ a b c Chisholm 1911, p. 61. ^ a b c d Chisholm 1911, p. 62. ^ Lessard, Micheline (2015). Human Trafficking in Colonial Vietnam. Abingdon, UK: Routledge. ISBN 9781138848184. This article incorporates text from a publication now in the public domain: Chisholm, Hugh, ed. (1911). "Annam" . Encyclopædia Britannica. 2 (11th ed.). Cambridge University Press. pp. 61–63. E. Sombsthay, Cours de législation et d' administration annamites (Paris, 1898). For modern histories of Vietnam in English, see History of Vietnam#References. This page was last edited on 27 March 2019, at 09:18 (UTC).